Applicants with fair credit. Consumers with fair credit can utilize this card without paying a balance transfer fee or annual fee. 24-7 access to your account helps you build credit for the future. The Capital One Platinum Credit Card is one of our top picks for the best credit cards of 2019. 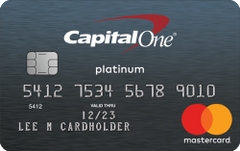 Our take: If you want to build credit without a secured credit card, the Capital One Platinum Credit Card is worth a look for its valuable perks and features that make building credit easy.